The Walker County school board has approved a public participation policy that encourages potential speakers to make the board the last stop for airing concerns. The new policy, approved during a Board of Education meeting Tuesday night, Nov. 13, does not include a proposal that would have allowed potential speakers to sign up just hours before a meeting to address the board. At Tuesday's (Nov. 13) board meeting Schools Superintendent Damon Raines meticulously explained a proposed revised public participation policy that included every suggestion and modification recommended by school board members. Then board chairman Mike Carruth, after asking if there were any questions or comments on the revision, requested a motion to accept the revised policy as presented. "Do I have a motion to accept this public participation policy?" he asked again. Then board member Karen Stoker, who in a Nov. 5 meeting had been adamant about an alternate option that would allow concerned petitioners to address the board after having registered and signing a sign-in sheet at least two hours prior to the start of any board's regularly scheduled meeting, asked the chairman if she could speak. Stoker then withdrew her recommendation for a direct, alternate public address option, after having strongly lobbied for that option three times in the previous meeting, and asked that that alternate address option be removed from the revised policy. She explained that the other changes and timelines in the new revised policy satisfied her and that she wanted to be sure that all petitioners followed the prescribed chain of command, taking issues through the pre-request channels of classroom teacher, school principal, and superintendent before addressing the board. "I would always want a parent or student who had a concern to come to (the teacher) first and then go up the chain of command," Stoker said. "I thought about it along those lines." She then moved to accept the revised public participation policy with the deletion of the alternate address procedure. Her motion was seconded, and the motion and acceptance of the new policy was approved unanimously by the board 5-0. Raines then told the board that he had discussed with the school system lawyer "fast tracking" the measure to allow petitioners to address the next school board meeting on Monday, Nov. 19, if they met the conditions of the new policy. While the revised policy does contain some "tweaks," in essence the main difference is the timeline in dealing with petitioners' issues and requests. It was that open timeline that a U.S. District Court judge ruled "unconstitutional" in 2016, and said if the system wanted a public address policy, it would have to revise and correct that problem by stipulating a deadline for when the superintendent would meet with petitioners. Under the revision accepted Tuesday, Nov. 13, Raines or another central office designee must meet with the petitioner within five business days of the request. They then have five more days to report back to the potential speaker. The next meeting of the school board is 6 p.m. Monday, Nov. 19, at the Department of Education building at 201 S. Duke St., LaFayette. Thanksgiving is a holiday to give thanks and share special moments with family and friends. While the original Thanksgiving might have taken place during a time when food was sparse, nowadays Thanksgiving often involves excessive amounts of food, with more food ending up in the garbage than in celebrants' stomachs. The United States Department of Agriculture projects that Americans will throw away more than 200 million pounds of edible turkey meat this Thanksgiving holiday. And Thanksgiving typically ushers in a period of wastefulness, as the U.S. Environmental Protection Agency says American households produce roughly 25 percent more trash between Thanksgiving and New Year's Day than during the rest of the year. Reducing waste is a worthy goal year-round, but especially so during the holiday season. And accomplishing that goal can be done without sacrificing holiday traditions. • Use fine china when serving meals. Thanksgiving provides an opportunity to serve meals on fine china and use the silverware that has gone unused instead of disposable plates and utensils. In addition to adding a touch of elegance to meals, reusable china and silverware is less wasteful than paper plates and plastic utensils. Cloth napkins and other table linens are also more eco-friendly than paper napkins. • Decorate using natural items. Scour the great outdoors for all-natural centerpiece materials or other items that can be turned into wreaths and garlands. Vases filled with pine cones and acorns make for beautiful, inexpensive and festive decorations. turkey breasts, which tend to be the most popular cuts of the bird. Use reusable shopping bags to carry items home and reduce waste even further. • Light candles and reduce energy consumption. During the meal, eat by candlelight and turn off lights in other areas of the home that are not in use. Rather than turning on the television, take the party outdoors and play a game of football on the front lawn. • Have a local Thanksgiving. Start a new tradition and invite nearby friends and family over for the holiday instead of traveling long distances. According to Use Less Stuff, a resource for eco-conscious men and women, if each family reduced gasoline consumption by one gallon (roughly 20 miles), they could reduce greenhouse gas emissions by one million tons. • Coordinate recipes with friends and family so you don't end up with 3 green bean casseroles (unless if you want 3 green bean casseroles!). Setting up a shared Google Doc is a great way to simultaneously plan the meal with the friends and family you're sharing the day with. • Prepare less by cutting recipes in half. If you can't have Thanksgiving without sweet potato casserole, but like me also "need" to make at least five other traditional side dishes, consider making a half recipe for one or all dishes, instead of full recipes. Tips for halving recipes can be found here and here. • Only buy the ingredients you need for your recipes. Buying in bulk is only really efficient when you actually need something in bulk. It's hard to resist a two pound bag of pecans in the heat of the moment at Costco, so maybe remember ahead of time that you can get nuts by the scoop from your smaller grocery store. • Avoid impulse purchases; I don't really need a pre-baked apple pie from the bakery section when I know we already have pecan and pumpkin pies in the works! • Send home the leftovers. Send each guest home with some leftovers if you have any. This way the refrigerator isn't left full of items that will end up uneaten. Otherwise, donate uncooked food to a local food bank. Use any scraps of vegetables in a com post pile. • Don't let recycling fall by the wayside. Remember to recycle all applicable items. Just because it's a holiday doesn't mean recycling habits should be forgotten. Encourage guests to pitch in by clearly marking recycling bins. Thanksgiving can be less wasteful without detracting from the enjoyment and true meaning of the holiday. As we observe and celebrate Thanksgiving this week, we recall how our ancestors the Pilgrims were helped that first winter by friendly Indians, who taught them how to grow crops and helped them survive their first winter in America. 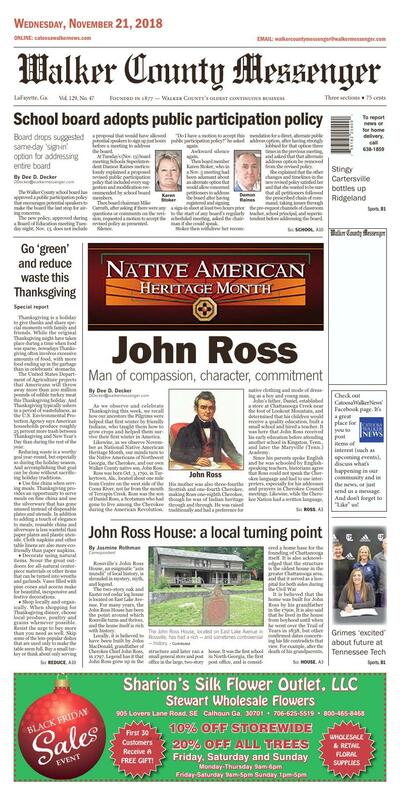 Likewise, as we observe November as National Native American Heritage Month, our minds turn to the Native Americans of Northwest Georgia, the Cherokee, and our own Walker County native son, John Ross. Ross was born Oct. 3, 1790, in Tur-keytown, Ala., located about one mile from Centre on the west side of the Coosa River, not far from the mouth of Terrapin Creek. Ross was the son of Daniel Ross, a Scotsman who had gone to live among the Cherokee during the American Revolution. His mother was also three-fourths Scottish and one-fourth Cherokee, making Ross one-eighth Cherokee, though he was of Indian heritage through and through. He was raised traditionally and had a preference for native clothing and mode of dressing as a boy and young man. John's father, Daniel, established a store at Chattanooga Creek near the foot of Lookout Mountain, and determined that his children would receive a quality education, built a small school and hired a teacher. It was here that John Ross received his early education before attending another school in Kingston, Tenn., and later the Maryville (Tenn.) Academy. Ross never learned Cherokee, using only English in his journals, business records, and later political correspondence, even with members of Congress. After attending South West Point Academy in Tennessee, Ross married Quatie (also known as Elizabeth Brown Henley) in the summer of 1813. They raised five children together, although she gave birth to a sixth, who was stillborn. Early in his life, he witnessed much brutality on the American frontier as both Indians and settlers alike were constantly raiding the Cherokee villages. At the age of 19, Ross was sent by U.S. Indian Agent, Return J. Meigs, on an official mission to the Western Cherokee of Arkansas in 1809. Due to his quiet and reserved manner, the mission was a success as he inspired confidence among both the Indians and the white settlers. Proving his leadership and diplomacy at an early age, he was immediately sent on another trip. During the War of 1812 he served as an adjutant in the Cherokee regiment. Though the Cherokee fought valiantly without receiving any pay, they were still not considered to be true Americans. A year later he fought in the Creek War of 1813-14 along with Gen. Andrew Jackson and 1,000 other Cherokee. He rose to the rank of lieutenant, and he participated in the Battle of Horseshoe Bend against the British-allied Creek Indians, defeating the Creeks and restoring peace. Returning home in 1815, Ross and Timothy Meigs opened a trading post on the Tennessee River that soon became known as Ross's Landing. In addition to providing supplies at the trading post, a ferry was used to transfer merchandise and people across the river. During his time at the trading post, a group of Congregationalists, descendants of the Puritans, built a mission at Ross's Landing called the Brainerd Mission. Ross, recognizing the value of a good education, did everything that he could to help the missionaries in their effort to provide schooling for the Cherokee youth. At the trading post, Ross began selling goods to the U.S. government, and the profits from the store at Ross's Landing (at present-day Chattanooga) enabled Ross in 1827 to establish a plantation and ferry business farther south where the Oostanaula and Etowah rivers flow together to form the Coosa River, located at what is now Rome. Also an astute businessman, Ross was involved with a number of business ventures, owned a 200-acre farm near Rome, and owned a number of slaves. During this period Ross's diplomatic skills enabled him to achieve prominent positions, culminating in his election as principal chief of the newly formed Cherokee Nation, which Ross, along with his friend and neighbor Major Ridge, helped to establish. Ross, along with Ridge, the speaker of the Cherokee National Council, established a capitol at New Echota near present-day Calhoun, Ga., on Nov. 12, 1825. He then became assistant chief of the Eastern Cherokee, participating in the drafting of the Cherokee Constitution in 1827. The constitution was modeled after the U.S. Constitution, including a Senate and a House of Representatives. John Ross was elected principal chief of the Cherokee Nation in 1828 at age 38, a position he held until his death in 1866. As Ross took the reins of the Cherokee government in 1827, white Georgians increased their lobbying efforts to remove the Cherokees from the Southeast. Over the next ten years, Ross fought the white settlers who were attempting to displace the Cherokee from their lands. Fighting not with weapons, but with words, he turned to the press and the courts to support the Cherokee cause. His faith in the republican form of government, the authority of the U.S. Supreme Court, and the political power of Cherokee supporters, especially the Whig Party, gave him confidence that Cherokee rights would be protected. However, the discovery of gold on Cherokee land near Dahlonega, Ga., fueled the settlers' desire to possess the area, which was dotted with lucrative businesses and prosperous plantations like Ross's. After gold was discovered in White County in 1828, the state began to push even harder for removal of the Indians. The Georgia legislature soon outlawed the Cherokee government and confiscated tribal lands. When the Cherokee appealed for federal protection, they were rejected by the president. The Indian Removal Bill passed by Congress in 1830 provided legal authority to begin the removal process. Ross's fight against the 1832 Georgia lottery, designed to give away Cherokee lands, was yet another of many political battles. When the fraudulent Treaty of New Echota was approved by one vote in the U.S. Senate in 1836, Ross continued to believe that Americans would not oust the most "civilized" native people in the Southeast. Ross and the Cherokee National Council maintained that the document was a fraud and presented a petition with more than 15,000 Cherokee signatures to Congress in the spring of 1838. Other white settlers also were outraged by the questionable legality of the treaty. On April 23, 1838, Ralph Waldo Emerson appealed to Jackson's successor, President Martin Van Buren, urging him not to inflict "so vast an outrage upon the Cherokee Nation." But it was not to be. As principal chief of the Cherokee Nation, John Ross struggled until 1838 against the removal of the Cherokees from the Southeast, when it was clear there was no alternative. Then he successfully negotiated with the U.S. government to handle the business of the move. Beginning in 1838, however, he was forced to lead the Cherokees through the tragic removal period, which culminated in the Trail of Tears. Along the 2,200-mile journey, road conditions, illness, cold, and exhaustion took thousands of lives. Ross supervised the removal process from Tennessee until December 1838. Ross, Quatie, and their children then joined the last detachment of departing Cherokees, who were traveling by boat because they were too old or sick to travel overland. The last and smallest (about 230 people) detachment of the removal started out by water on Dec. 5, but had to go overland when ice on the rivers prevented further water travel. Among those in this final group was Chief Ross and his wife Quatie, who noted: "Long time we travel on way to new land. People feel bad when they leave Old Nation. Women cry and make sad wails. Children cry and many men cry ... but they say nothing and just put heads down and keep on going towards West. Many days pass and people die very much." Toward the end of her overland part of the exodus, their party ran into freezing rain and belowzero temperatures. Although suffering from a cold, Mrs. Ross gave her only blanket to a child, caught pneumonia and died near Little Rock, Arkansas, in early 1839. Noted John Burnett, a militiaman accompanying the party: "This noblehearted woman died a martyr to childhood, giving her only blanket for the protection of a sick child. She rode thinly clad through a blinding sleet and snow storm, developed pneumonia, and died in the still hours of a bleak winter night, with her head resting on Lt. Greggs saddle blanket." She was buried along the Trail of Tears. Another source reported that Chief Ross's grandson, Jim Ross Jr., also died on the exodus and was buried in an unmarked grave near Aurora, Missouri. Though the federal government officially stated some 424 deaths, an American doctor traveling with one the party estimated that 2,000 people died in the camps and another 2,000 along the trail. Other estimates conclude that almost 8,000 of the Cherokee died during the Indian Removal. No wonder they called the removal route the "trail where they cried," or the Trail of Tears. Once the tribe was relocated to a site near present-day Tahlequah, Oklahoma, John Ross was re-elected principal chief. Soon, land was set aside for schools, a newspaper, and a new Cherokee capital. During the Civil War, the Cherokee aligned themselves with the Confederacy, a declaration that repudiated any treaties that had been formerly signed with the federal government. In September 1865, Ross attended the Grand Council of Southern Indians at Fort Smith, Arkansas, where new treaties between Cherokee and the federal government were prepared. In July 1866, though in failing health, he accompanied a delegation to Washington where new the treaties were signed on July 19, 1866. Soon after the treaties were signed, Ross went to bed at the Medes Hotel in Washington D.C. where he died on Aug. 1, 1866. Although first buried beside his wife Mary in Wilmington Delaware, his body was returned to Indian Territory a few months later where he is buried at Ross Cemetery in Park Hill, Oklahoma. "By the stipulations of this instrument (the fraudulent Treaty of New Echota), we are despoiled of our private possessions, the indefeasible property of individuals. We are stripped of every attribute of freedom and eligibility for legal self-defense. Our property may be plundered before our eyes; violence may be committed on our persons; even our lives may be taken away, and there is none to regard our complaints. We are denationalized; we are disfranchised. We are deprived of membership in the human family! We have neither land nor home, nor resting place that can be called our own. "In truth, our cause is your own; it is the cause of liberty and justice; it is based upon your own principles, which we have learned from yourselves; for we have gloried to count your Washington and your Jefferson our great teachers; we have read their communications to us with veneration; we have practiced their precepts with success. "And the result is manifest. The wildness of the forest has given place to comfortable dwellings and cultivated fields, stocked with the variousdomestic animals. Mental culture, industrious habits, and domestic enjoyments have succeeded the rudeness of the savage state. "We have learned your religion also. We have read your Sacred books. Hundreds of our people have embraced their doctrines, practiced the virtues they teach, cherished the hopes they awaken, and rejoiced in the consolations which they afford. To the spirit of your institutions, and your religion, which has been imbibed by our community, is mainly to be ascribed that patient endurance which has characterized the conduct of our people, under the laceration of their keenest woes. For assuredly, we are not ignorant of our condition; we are not insensible to our sufferings. We feel them! We groan under their pressure! And anticipation crowds our breast with sorrows yet to come. We are, indeed, an afflicted people! Our spirits are subdued! Despair has well nigh seized our energies! "But we speak to the representatives of a Christian country; the friends of justice; the patrons of the oppressed. And our hopes revive, and our prospects brighten, as we indulge the thought. On your sentence, our fate is suspended; prosperity or desolation depends on your word. To you, therefore, we look! Before your august assembly we present ourselves, in the attitude of deprecation, and of entreaty. On your kindness, on your humanity, on your compassion, on your benevolence, we rest our hopes. To you we address our reiterated prayers. Spare our people! Spare the wreck of our prosperity! "Let not our deserted homes become the monuments of our desolation! But we forbear! We suppress the agonies which wring our hearts, when we look at our wives, our children, and our venerable sires! We restrain the foreboding of anguish and distress, of misery and devastation and death, which must be the attendants on the execution of this ruinous compact." The John Ross House, located on East Lake Avenue in Rossville, has had a rich — and sometimes controversial — history. Rossville's John Ross House, an enigmatic "axis mundii" of local history, is shrouded in mystery, myth, and legend. The two-story oak and Easter red cedar log house is located on East Lake Avenue. For many years, the John Ross House has been the point around which Rossville turns and thrives, and the home itself is rich with history. John Ross sold his interest in the house in 1828 and was elected as the last principal chief of the Cherokee before their forced removal. By the 1830s, a surveyor by the name of Thomas McFarland (McFarland Avenue's namesake) bought a title for the land on which the John Ross House stood. He became postmaster and established his family in Rossville. Furthermore, the validity of the written history of the house is questioned by some locals. In fact, in two 2007 site visits, twentyeight core samples were taken from some of the oak logs on the original structure of the house. Of those, twenty-one were successfully dated, and more than half of them had cutting dates around the winter of 1816-17. According to this, that would place the home's construction date in the early 1800s. Therefore, these dates retrieved from the original structure, according to some, seem to indicate that, while it is possible that Ross's elderly grandfather built the home in 1816, it is more likely that Ross built the structure himself. Thus, while the John Ross House is certainly a historical structure, it is admittedly shrouded in a certain amount of legend, myth, and even a degree of mystery.